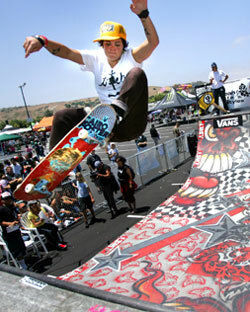 The All Girl Skate Jam in it's eight year, was hooked up with the Van's Warped Tour at the Coors Ampitheatre in San Diego on Thursday June 30, 2005. 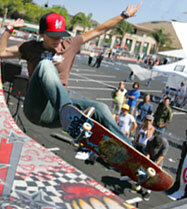 There were three amateur heats and a pro jam. 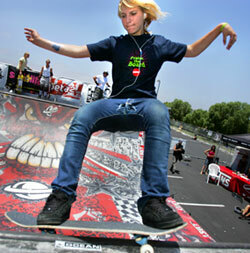 The girls tore the mini ramp up all day while the Warped bands played in the background. The competition was tight and after a very long deliberation and a skate off, Nugget won first place in the amateur division, April Woodcock won the pro jam and Curly Grrlz rider Lea Taylor took first place for the groms. It was amazing to see these girls ride in person. So much style and athletic talent. 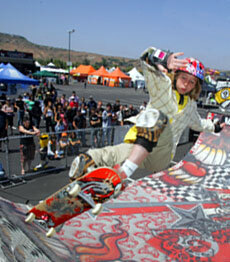 What impressed me the most about the day were the groms. 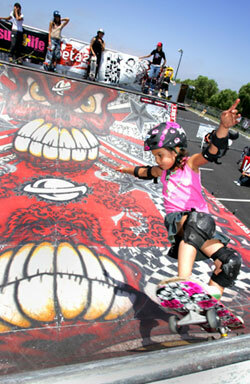 Little five year old Alize Montes was shredding so hard that even large men with mow-hawks stopped to watch. The future looks very bright for women's skating. It's good to be a girl.